Buy kilo Gold Bars minted by the Royal Canadian Mint (RCM) which contain 1 kilogram (32.15 oz) of .9999 fine gold bullion. These kilo gold ingots are a great addition to any gold investment portfolio. Buying gold bars like these 1 kilo RCM Gold Bars is a cost effective option for serious gold bullion bar buyers who appreciate low gold bullion prices. This 1 kilo gold ingot maintains the famous Royal Canadian Mint tradition of producing beautiful gold bars and gold bullion products. It incorporates design features from the iconic gold Canadian Maple Leaf coins. This RCM kilo Gold Bar includes the instantly recognized mark of the Royal Canadian Mint, a well respected refiner on the "good delivery lists" of the world gold bullion bar industry. Highlighting the heritage shared amongst all of the Royal Canadian Mint's bullion investment products, stylized maple leaf marks have been added, which evoke the laser mark security feature from gold bullion Maple Leaf coins. Additionally this gold kilo bar's unique serial number is now bordered by a series of vertically engraved lines, inspired by the modern Maple Leaf Coins' radial line finish. Kitco offers 1 kilo gold bars for sale on our online store, with competitive gold prices. Buy RCM 1 kilo gold bars online at Kitco. You can buy gold kilo bars and elect to take discrete direct delivery or choose to store your kilo RCM Gold Bars safely and securely with Kitco Allocated Storage. Kitco offers global options for gold bullion bar storage that are fully segregated, insured and allocated. Kitco's network of top-tier gold vaults include some of the most secure storage facilities located in Canada, Hong Kong or the United States (COMEX approved). Cayman Islands gold bar storage is also available (certain conditions apply). Find out more about keeping your gold bar and physical precious metal purchases secure, with our Global Precious Metals Storage Solutions. Why buy Canadian kilo Gold Bars from Kitco? 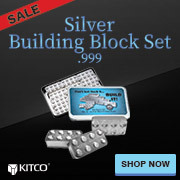 Kitco is a trusted leader in the gold bullion bar and physical precious metals industry. Kilo gold bars and other precious metals sold by Kitco are recognized in gold bullion markets around the world. With our focus on gold bullion, you can benefit our low gold prices and premiums that are highly competitive in the industry. At Kitco, we strive to make managing you tangible wealth safe and easy. You can sell or buy gold and other precious metals using our convenient online store, or by contacting our team of highly trained precious metals specialists. Backed by our global information network, Kitco has proudly served our customers since 1977. The RCM kilo Gold Bar(s) you receive may not be in mint condition.